This season has felt so long and hard, and yet it has also felt like a Season: temporary, cyclical, and worn. 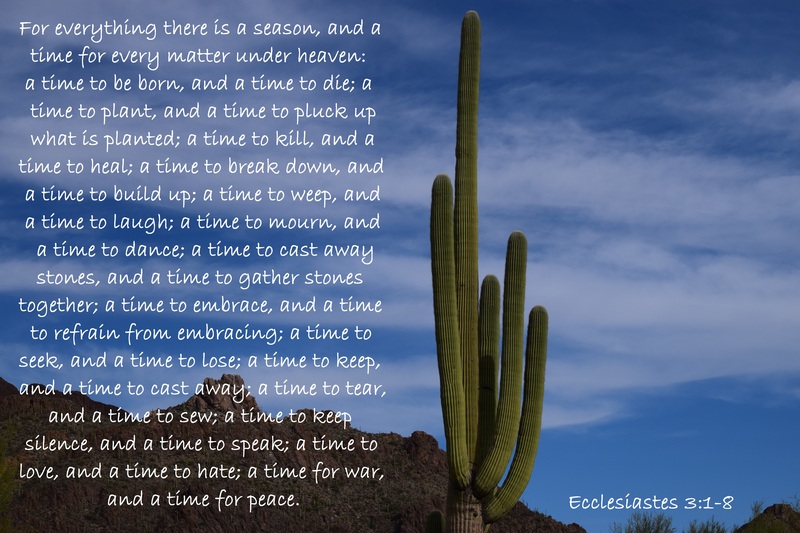 I just read Ecclesiastes again recently. The main theme is that there is a season to everything, and because of this there is nothing new under the sun. It may seem like we are striving in vain, and in fact, we are. God did not create us to strive for wealth, power, opportunity, freedom, etc. He created us to worship Him with all our hearts, souls, and minds. So as we toil and work, we should do so to His glory and in joyfulness. This does not mean that we won’t have seasons of grief, I am currently in one. It does mean that even in this season I want to look for the purpose God has me here today, rather than with my husband and two-year-old. I have been keeping track of at least one reason each day that God has me here. This has been a new exercise in gratefulness because it is making me focus on God, which I knew was a main lesson I needed. I needed to learn that my family is not the most important thing. I realized that my desperation and grasping, that feeling of drowning and paralysis, when my boys left was the effect of idolatry. I had made them so important in my life that they had been raised higher than God. I have talked about idolatry many times before because this is something I try to stay aware of at all times. But for some reason it crept back in as seasons changed. As we moved, it was just easier to hang out with them to absorb the shock of moving around so much. When I am pregnant I have a lot of trouble reading, and this also gave me reason to find ways to just hang out as a family doing things rather than alone with God. The seasons shifting, and the joy that I had going into the seasons, allowed me to grow lazy and forget to plant a new harvest because the last one was so good. Seasons are often talked about in Christianity, but I have never before related to it. Now I see that some of the reason we fall back into old sins is that a new season comes and we are unprepared. When I was pregnant in Lebanon I had my Quiet Time figured out for that season. However, that season is past, and even when I go back it will look slightly different because of the new baby. However, seasons are cyclical, so a similar season will come when we return and I will be able to put together a similar routine. It is like adding a plot of land to the farm, I have more land and a new routine will make it possible to water, seed, and harvest all my land. When the baby was born I already knew that my Quiet Time would be disrupted for awhile. My Bible reading moved to solely the reading I was doing with Davy each night. And because of this I was able to take a season to increase the amount of Bible he and I were reading together. We were up to five chapters a night when they headed back to Lebanon. Then it was a new season altogether. I had no Bible reading time scheduled in. It took a few weeks, but now I have a new routine to wake up and get to the Bible. I already know the seasons are going to change again very soon, but now I am going to be prepared. Instead of being hit with each season unaware I was able to prepare for a period of time which would have less Quiet Time by reading and studying and writing so much while pregnant. Now I can see the change coming and can work that same preparation in other areas. I have no idea why this has only just occurred to me, but it is aiding my life goals. There are so many things God has shown me in this time, and so many of them are not new lessons. I think that Ecclesiastes can seem so discouraging to people when it says, “There is nothing new under the sun.” People want new, but in reality our lives are so short much that is old will seem new to us. Ex Machina is a movie that came out recently. To many people it was unique, new, and that was exciting. I enjoyed it, too, but I have read everything Isaac Asimov has ever written, so I was not able to say any of it was new. The ideas were strung together in a different way and with different people, but the story was not brand new. Nothing is. I have learned that this is not discouraging, it is a huge help in simplifying. Knowing that a season will not last helps me to remain guided by God. When I think I can control the things around me, not recognizing their short life, I set myself up for failure. I am finishing an ecourse called Make Over Your Mornings, which has really been all about seasons for me, and as I have determined new evening and morning routines, it has been essential to see what is happening in this current season instead of trying to figure out how this will apply to the future. Where am I at right now? This allows honesty with myself, which helps me stay accountable, and to grow. It is also an exercise in trusting God because I know my season is changing. But even if I wasn’t going to be moving in the next few months, I need to always remember the season I am in will not last. Whether it is a season of poverty or abundance, loneliness or crowded, and I need to continue to rely on God, to thank Him and to seek the reason I am here today.